me.enirav.com – throw | throw – The Unhandled Exceptions of Life! These are one-liner goof-ups that I’ve collected over the last 25+ years. Believe me, people have actually (and seriously) used these in their day-to-day life. That also comedy became… No? Network mein wire nahi hai kya? A song from the movie BICHCHOO (Bobby Deol & Rani Mukherjee). The English line sung as part of the song is incorrectly translated from Hindi. A devotee’s concerned letter to Goddess Lakshmi, on the eve of Diwali 2010! Blessings, are what everyone *wants* from You this season (Diwali). Every devotee of Yours pleads, begs, requests, demands, prays and then, expects a shower (rather, a thunderstorm) of Your kind blessings. Every prayer, every pooja conducted, is only done to appease You. Every devotee of Yours *wants* You to set up a permanent “camp” in their household, and in their life. Of Your devotees, salaried people like me, are fortunate to have a regular shower (albeit relatively little) of Your kind blessings (with minute annual increments) – even though we also duly share our share of the blessings with the government, honestly/forcibly. Then there are Your other bunch of devotees, businessmen, most of whom are Your ardent devotees and You also shower them with a relatively decent share of Your kind blessings. They’re further able to maximize their exposure to Your shower by employing certain loopholes in the law, or even by breaking the law. These devotees are a little more casual to their approach of maintaining their devotion – a few being spendthrifts – however, they still continue to stay under Your shower’s fair share. However – even though these two classes of people, viz. salaried class & the businessmen, form a overwhelming majority of Your ardent, hardworking & karmic devotees — it seems that some of the rest, less than 0.1% of Your “supposed” devotees are the ones who are the ones You seemingly bless the maximum. These so-called “devotees” undertake roles/work which they are utterly unqualified for (recently, the CWG) – and still rake sackfuls of Your blessings without actually moving a finger, until there’s some “aakashvani” (media/press) forcing them to act. They do “act”, but just as in “acting” & play around with the money, as well as the emotions of the countrymen. I can go on… however, to resolve this, I’d sincerely suggest You to get some sort of a UID (Unique Identifier) assigned to all Your devotees, so as to ensure that you shower Your blessings’ ration after careful scrutiny of the karma of Your deserving devotees. Which car to buy: Petrol or Diesel? Have you pondered over this question? and is known to be more polluting than the petrol variant! One of the primary reason why diesel cars are preferred in India is: Diesel is cheaper than Petrol! The other being, diesel cars give a better mileage as compared to petrol cars. So, is it really worth buying a diesel car, anyway? If you buy a petrol car – saving approx. Rs. 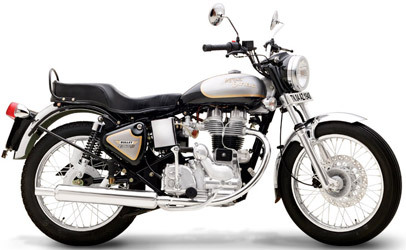 1.00 lakh – that can buy you about 1970 litres of petrol at the prevailing prices, for that amount — and drive atleast 26000 kms. At the same time, to make up for the additional Rs. 1.00 lakh that you pay for a diesel car, it would need you to spend atleast Rs. 2.9 lakhs to buy 7692 litres of diesel, which otherwise you would’ve spent about Rs.3.9 Lakhs to buy the same 7692 litres of petrol — thus saving you Rs. 1.00 lakh. Q1. Have you ever bought something just because your favourite celebrity was endorsing it? Q2. Have you *not* bought something that *you wanted*, because a celebrity you disliked, was endorsing it? If you said a “YES” for any of the questions above, you can go back to what you were doing before coming to this article; sorry – but this blog further, is not for you! Celebrities charging a few lakhs for endorsement deals are passé; multi-crore deals are routine. Aamir Khan’s in the news, ofcourse. Other than the success of 3idiots, he’s supposedly basking in the glory of making Rs.30-35 crores, being an “idiot”… A *damn* smart “idiot” though! 😉 Obviously, the success of 3idiots should’ve dug a deeper hole in UAE’s Etisalat’s pockets. Aamir is already endorsing a few others, like TataSky, Toyota Innova, CocaCola & Parle G. So more than movies, he’s obviously minting better with the ad deals. Now, why would he want to do more than 1 movie in an year? Eh?! 😉 He needs the time to do ads! Do you remember that most trade analysts had estimated the “brand value” of Amitabh, Abhishek & Aishwarya, after the Abhi-Ash marriage, to be around Rs.800 crores?! Unfortunately, I don’t suppose any of the “3bachchans” are milking their true “brand values” though, except maybe for the recent Lux ad series where, we heard, they were paid Rs.16 crores in all (package-deal). So, why do brands signup celebrities? After the initial promotional period, the product’s demand would shortly stabilise (typically reduce, but stablise… So supply stabilises too.). Of course, this assumes the product was good indeed. And in turn, it is finally us – the consumers – who end up footing the endorsing celebrity’s bills! And we don’t stop there, we continue to pay it everytime we buy/subscribe to the endorsed product. Typically about 30-60% of the marketing budget of companies is allocated for celebrity endorsements. So – if the companies could come up with some better method to gain recognition, build trust & cultivate brand recall in their consumers – the cost of the products could be reduced by atleast 30%. So the next time you drink a CocaCola® Coke with a Parle® G biscuit in hand, after coming back from your office in your Toyota® Innova and switch on your TataSky® SetTopBox to pay & watch 3idiots – remember you’ve been made one too! Not intending to rake up (like I can!) the controversy that has now cooled down, but personally I feel the movie was not as much as 70% taken from the book – as claimed by Chetan Bhagat. It also isn’t as low as 10-20% as claimed by Rajkumar Hirani & Vidhu Vinod Chopra. Instead, to me, the movie seemed to be about 50% similar to the book. The basic story, the characters, the plot – except the climax – were all from the book. The message was obviously stronger in the movie. As a lifetime subscriber & self-appointed advocate of the message, I’ve also always said (rather argued with many relatives/friends/contacts) that – the Indian education system needs a major revamp. Churning out graduates doesn’t do any good for the industry, which would eventually employ them. The syllabus is old, the teachers aren’t experts in the subjects they teach (they’ve also come from the system itself), the knowledge imparted is shallow & there’s no value-addition. I could never study for an exam, but – when asked to implement/present a new concept, I’d delve into it wholeheartedly. Somehow exams never meant important to me. The seriousness never kicked in, except for the worry of flunking. As in the book, where Ryan says – mug mug mug & then puke in the exams. Similarly, I also don’t completely agree to the recruitment system where candidates are first filtered based only on their “qualifications”, and not on their capabilities. We still read “Only B.E./B.Tech. candidates should apply” in the usual job ads. Why? I’d understand the need for it, if the job required specific engineering skills. The concept from the “Hindustan Bol Raha Hai” BSNL ad, where in a remote village Deepika Padukone consults a doctor over a video conference while delivering a baby, was used in the movie when the guys delivered Mona’s baby. I wondered if the child would actually grow up to be a watchman. Yeah – seriously – throughout the movie, he/she reacted only to “Aal eej vel“… Right? Instead of Ryan’s Lube project in the book, Rancho had the “ViruS Inverter”. Instead of Alok jumping from the top of the insti’s roof, Raju jumped from the window in ViruS’s room. The movie had the hilarious “teacher’s day” speech – which was not there in the book. The movie had the hospital sequence where Rancho & Farhan desperately try to revive Raju, again not from the book. The book did not have “Jahanpanaah, tussi great ho! Tussi toph ho! Tohfa kabool karo!“. Many jokes/ideas/scenes were picked up from popular e-mails/pictures circulated on the internet, especially the 5 burqa clad women being photographed at Simla, the mixing up of the answer sheets after asking the supervising professor if he know the three of them, the use of pencil in space (US Vs. USSR, where USSR were the bright pencil users instead of spending millions like what the US supposedly did to get an anti-grav pen invented!) — then also the Rancho electrocuting the ragging senior’s scene – among others. To conclude – disregard the controversy – “Aal eej vel” now! After reading: http://webtips.dan.info/brand-x/useragent.html, its clear that the web-browser shares are not 100% accurate… rather they cannot be 100% accurate. So how accurate are http://en.wikipedia.org/wiki/Usage_share_of_web_browsers and other “browser usage reports”? Five auto-rickshaw drivers are mysteriously killed on the road over a week. The passenger of the first auto-rickshaw, Maanvi Sharma, potentially provided a clue of a bike driver being the potential suspect. The investigating police sub-inspector D. K. Gowda had received a note from the supposed killer which explained the reason for the murders. The supposed killer wanted all the auto-rickshaw drivers to drive responsibly & strictly follow traffic rules. Recently, two cabs had a very bad accident on HAL Airport road – killing both the drivers on the spot. While one of the cab driver was shot by the killer for driving past a red traffic signal, the other driver died when the vehicles collided. The next day, a letter was published in most of the newspapers across Bangalore. The situation on the Bangalore roads, after the last murder & the published letter, was absolutely hunky-dory. *Everyone* was (suddenly!) very diligent & patient on the roads, strictly following lane discipline, respecting traffic signals and all this without unnecessary honking too! The auto-rickshaws, cabs & even two-wheelers – *all* of them, were demonstrating their best driving skills. Someone breaking a rule or about to break a rule – was immediately chided by fellow drivers. It all seemed right out of an unbelievable dream! As is popularly said (in Sanskrit) “Dandam Dashagunam Bhavate” – i.e. Just one ‘stick’ (punishment) can teach 10 good lessons, easily. As goes a very popular, but old Marathi song, “Chhadi lagey cham cham, Vidya yeyi gam gam“, i.e. You learn, as soon as you’re punished. Listen to the original song here, its really good. Q. Why do we Indians learn only when things are taken to the extreme? Q. Can we only learn with the fear of ‘punishment’, or after receiving the ‘punishment’? Q. How much can the governments & regulating/voluntary bodies do, if we – the citizens – do not comply by the country’s policies, rules & regulations? Q. How can we expect *anyone* (governments, leaders, NGOs, volunteers, etc.) to change us when civic sense is *utter nonsense* for us? Coming to reality (from fiction), are we waiting for something drastic to happen to us, before we improve our civic sense & driving skills on the roads? Will we always need a “chhadi” (a teacher’s stick!) to get our acts straightened? There is a limit to control the frustration… Its still within the limit, as of now. A month had passed since the last murder. The roads were still satisfactory, everyone was happy with the *drastic* change. Driving was no more war on the road, where you had to use all your skills to survive in life’s reality show. A clueless Gowda was happy with how the situation had turned, though he regretted not being able to solve the case & arrest the killer. The case had to be closed off, after a few months, as there was nothing which could be done further to solve it. The biggest festival for most Indians – Diwali – was close, and the ladies were busy scrubbing & cleaning their homes. Diwali was the “annual occasion” when the homes & offices got cleaned and/or repainted – to welcome the New Year (New Year for Gujaratis, Marathis & many others). Two auto-rickshaw drivers are mysteriously killed on the road over a period of two days. They both were driving at crowded places when they were killed & lost control over their respective vehicles. The passenger of the first auto-rickshaw, Maanvi Sharma, potentially provided a clue of a bike driver being the suspect. The investigating police sub-inspector D. K. Gowda has received the postmortem reports of both the driver’s bodies & they corroborate Gowda’s thought that both the killings are related & done by the same person. The two auto drivers were killed because they were rash drivers and had almost got me hurt or killed on the road. I was barely saved, others may not be so lucky, so I killed them to save the others. I do not want to hurt or cause worry to any passengers and I will do my best not to hurt them. As passengers, they should act responsibly and stop the auto drivers from rash driving and/or breaking traffic rules. 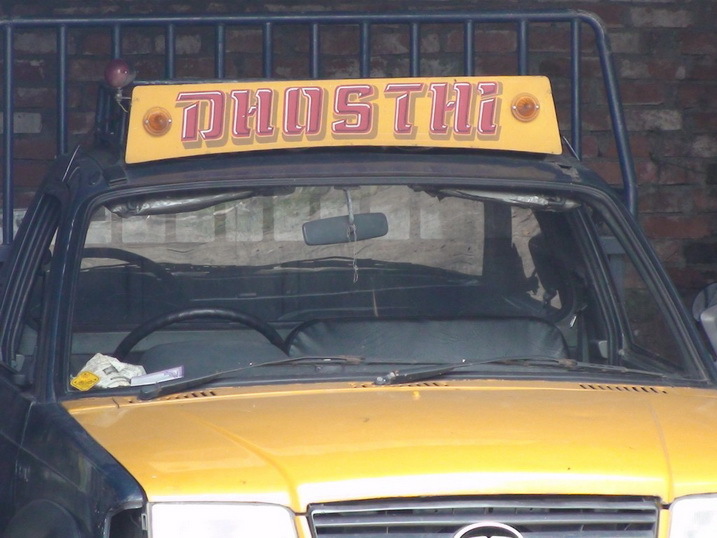 Henceforth any rash auto drivers I encounter, will be shot dead… INSTANTLY. Enough is enough! All auto drivers should strictly follow the traffic rules, obey the signals, show respect to other drivers on the road and drive safely; IF THEY WANT TO STAY ALIVE! Gowda noticed that the words were cut out from newspaper or magazine articles and cleanly glued on a plain paper in the correct sequence to form the sentences with appropriate punctuation marks. The sentences seemed grammatically accurate, opening up the possibility of an educated & professional person ‘writing’ it! Alongwith the motive behind the killings clarified, the person also seemed to be inspired from Kamal Haasan’s movie “Indian“, where a veteran freedom fighter (Senapati) takes upon a task to ‘clean’ the corrupt government departments by murdering all the corrupt government employees found harassing the public. As if in answer to his question, a few crime reporters rushed in and thronged Gowda’s desk. They started asking him for more information about the two auto-driver murders. Gowda told them that the investigation was in progress and that he had just received an anonymous note from the killer. He told them that both murders were linked and done by the same person, as per the note. On insistence from the reporters, he showed them the note from the killer. The next day, all the newspapers carried this story on their front page with pictures of the killer’s note to the police and with the regular sentimental masala about the murdered auto-rickshaw drivers’ families & their conditions. 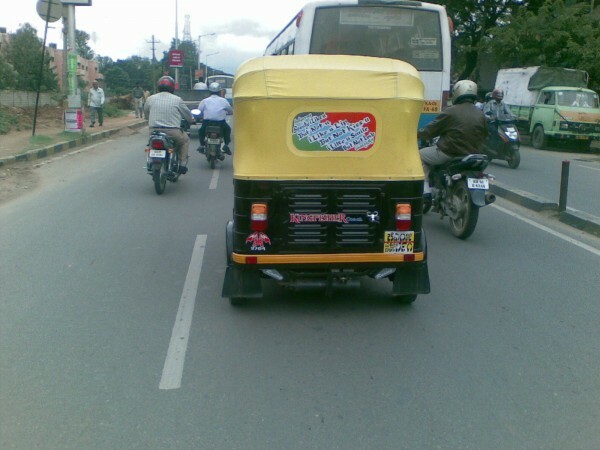 The auto-rickshaw drivers in Bangalore started to panic, with many of them not plying their vehicles that day. Later during that day, the Chief Minister visited the families of the auto-drivers and promised them a cash compensation of Rs.1 Lakh each from the government. He also faced the other auto-rickshaw drivers’ ire over the murders. The auto-rickshaw drivers’ union representatives also confronted the chief minister, and threatened the CM with an auto-rickshaw strike on the next day, if the killer wasn’t caught. They blamed the inability of the police to secure “innocent citizens” in broad daylight. The CM tried to pacify their anger, saying the police are investigating the case on priority and that they were tracing the clues to the killer. He said, the killer will soon be caught and put behind bars. He also asked them to communicate to all the auto-rickshaw driver unions & all their members to maintain their calm and not to break any traffic rules. They should all avoid provoking the killer, until he or she is traced & nabbed by the police. A couple of days later, with three more auto-rickshaw drivers shot dead – the situation wasn’t in Gowda’s (or rather anyone’s) control. The auto-rickshaw driver unions had called for a second day strike today to oppose the murders, and there were very few auto-rickshaws plying today. Those auto-rickshaws on the road, were driving very carefully – taking care not to offend any other drivers. They had suddenly turned very polite and stopped quarrelling with any other drivers & passengers. Gowda’s station got an urgent message from their central communication department reporting an accident involving two cabs (taxis) on the old airport road. An auto-rickshaw driver is shot dead by a mysterious killer near the Adugodi signal, while he was driving his passenger, Maanvi Sharma, to the Forum Mall. Though there’s a bad accident after the driver loses control, Maanvi escapes without any major injuries & informs the investigating police sub-inspector D. K. Gowda about an altercation between the auto-rickshaw driver & a bike rider a little while before the accident. She said she thought that the bike rider in a dark gray jacket & a small brown bag on his shoulders could have shot the driver. PSI D.K. Gowda hung up the call and jotted down the first description of the potential suspect received from Maanvi, though he couldn’t digest the thought that the bike rider could shoot down the auto-driver for such a petty reason. However, he couldn’t ignore any leads & any clues to a potential suspect. With the bike rider in the back of his mind, he left the police station to go to the accident spot to further enquire with the shopkeepers & residents in that area. After about an hour and after speaking to atleast a dozen shopkeepers & a couple of residents, he concluded that none of the shopkeepers or residents saw anything untoward until the accident occurred. They also did not notice any peculiar person on the road-side. Being a busy road as well as a busy market place, all this sounded pretty weird, but it really seemed like no one saw what actually happened. For someone to shoot a person – while both of them are moving, and with such accuracy to hit the head – he had to be a professional shooter. It was unlikely for such a professional shooter to shoot down a simple auto-rickshaw driver, while riding a bike. So it was quite possible that the shot was fired by someone standing on the road-side. It was also possible that the shot was fired to kill someone else at the location at that time, while it mistakenly hit the driver. The loud ringtone of his cell phone interrupted his flow of thought – there was a call from his station. He picked up the call, it was one of his constables from the station. He spoke with the constable for less than a minute, and rushed back into his jeep. 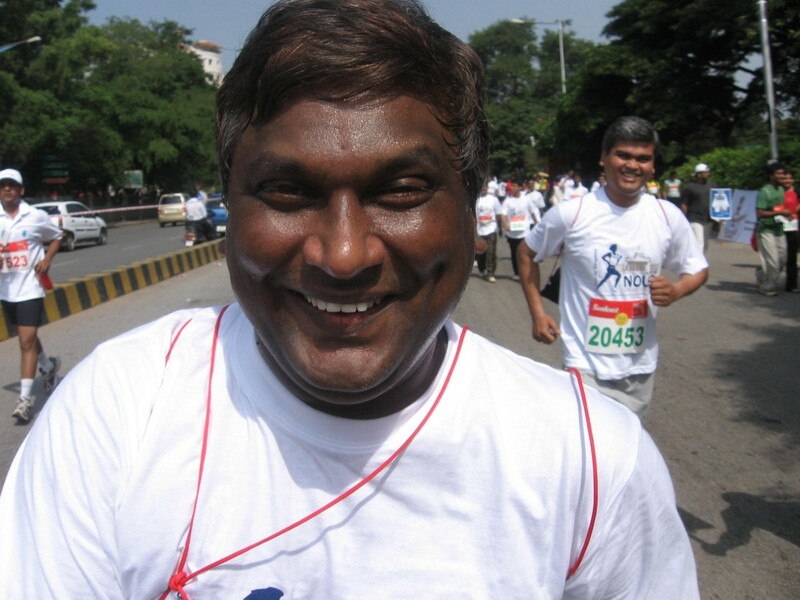 He asked his driver constable to rush to the Koramangala Water Tank, about 2.5-3.0 kilometers away. The driver drove towards the crowd & stopped the jeep close to the crowd. Gowda saw an auto-rickshaw which had crashed into the trunk of a big tree at the edge of the road. He alighted from the jeep and pushed aside a few people from the crowd to make way for himself. As soon as some of the people saw him, they themselves moved aside, making way for him to reach the accident spot. The vehicle’s front body was badly damaged due to the collision, so the driver seemed to have been at a high speed. On taking a closer look, Gowda saw that there was no passenger, but the driver was still in his seat crushed by the vehicle’s front body! Nobody could’ve survived in that position Gowda thought, and that was also probably why no one from the crowd had touched the driver – fearing he was already dead. However, Gowda called up his station & asked them to urgently send an ambulance and a couple of constables to the accident site. He then asked 2-3 people from the crowd to help pull out the driver from the vehicle. They broke off some leftover glass from the wind shield & pulled up the front of the auto-rickshaw with the help of the wind shield’s side bars. Slowly, they pulled out the profusely bleeding driver and laid him on the footpath next to the vehicle. Gowda inspected the driver, checked for his pulse – there was none, checked his nostrils to check for his breath – but no sensation there as well. He also noticed that there was a deep injury in the head, it seemed like something had pierced through the back of his head and caused a serious injury. Within another couple of minutes, the ambulance arrived. Gowda asked the paramedics to check the driver, if he was alive. They immediately tried to check if he was still alive, however finally concluded that the driver was already dead. Gowda asked them to take the dead body & conduct the post-mortem on it. He would now have to wait until the report arrived the next day, to ascertain the cause of the death as well as the cause of the deep head injury. By this time, his constables also arrived & with them he cordoned the site and started searching for any clues around the crashed vehicle. 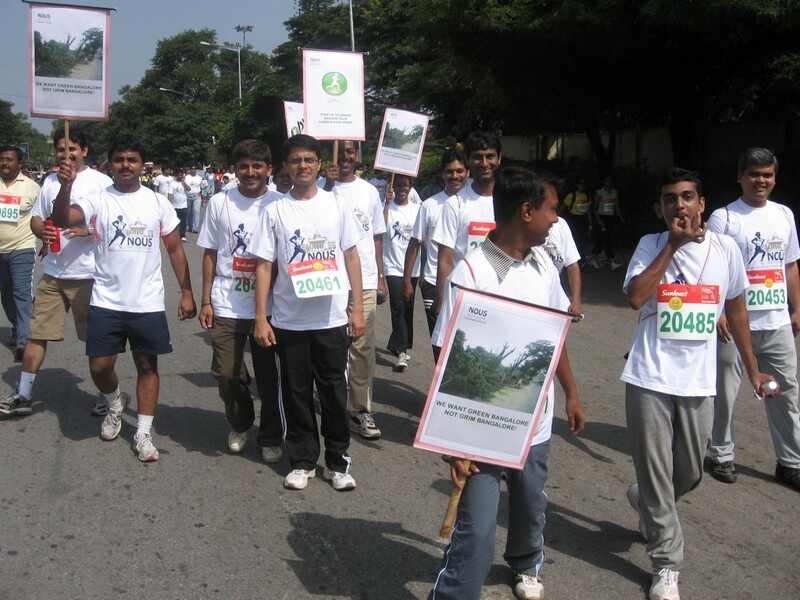 A couple of men raised their hand and walked towards Gowda. He asked them to relate what had happened. The second man replied, “Over there sir… near that gate sir…” & pointed to the white gate of a house on the service road, parallel to the main Sarjapur road. The two men nodded back. Gowda further instructed the constables to continue with the investigation process as he had to go back to the station. At the station the postmortem report of the first auto-rickshaw driver had arrived. It confirmed that the death had occurred with a bullet in the head which should have been shot from a maximum distance of 1.5 metres away from the head. The other details of the bullet & the gun used were also mentioned alongwith the other usual information. He skimmed through the report and asked his constable to get him a cup of tea. The next day, the second postmortem report also arrived and it seemed to corroborate his thoughts of the two accidents being related. The death of this driver was also with a bullet embedded in his head. It would’ve also been shot from a close range of a maximum of 2 metres away from the head. The bullet used & the gun type also matched for both the cases. With a deep sigh, he continues poring through the two reports. The shocked passenger was nervously happy to be alive with some injuries, after a close brush with possible death. The auto-rickshaw she was riding in, had suddenly swerved to the right & hit the median, causing the vehicle to topple to the left. Luckily for her, within a few seconds of the accident, some people from the crowd around the accident spot had rushed over and safely pulled her & the driver out. The people had carried her to the footpath and asked her to lay down there. After enquiring her how she was, she was helped to sit up straight and offered a glass of water to drink. The 22 year old law student had hired the auto-rickshaw to reach the Forum Mall, and now the vehicle lay badly damaged at the Adugodi signal. She looked at the scratches on her left elbow & left knee and covered her torn clothes with her dupatta. Gathering her strength, she pulled out her cellphone from her purse and checked if it worked. She made a phone call and then continued to check for any other injuries. Within a few minutes a police jeep with a sub-inspector (PSI) and 3 constables arrived. The constables pushed the crowd back with their lathis, while the sub-inspector looked around the vehicle, spoke to his constables & then asked aloud, “Was there any passenger?”. A few people from the crowd pointed to the girl and replied that she was the passenger in the auto-rickshaw. Sitting on the footpath holding a half-filled glass of water, the girl nodded at the PSI and searched around for the driver in the crowd. The PSI walked over to her and asked her if she was okay. She nodded again and continued to search for the auto-rickshaw driver. The PSI then asked her to relate what happened. She slowly recollected what had occurred and related the incident to him. She again turned around to search for the auto-rickshaw driver. The PSI helped her get up and slowly walk towards the vehicle. He showed her the driver’s dead body lying behind the vehicle. The body was lying in a pool of blood near his head. She just shook her head in disbelief, then closed her eyes and started weeping. She replied, “Yes yes… I called her a few minutes ago. She should be here any minute.” She turned her head towards the crowd searching for her sister. The PSI then said, “Okay, we need to check your bag & purse. Can you show it to him?”. He beckoned one of the constables to come over. Maanvi handed over her bag and purse to the constable, who checked it thoroughly and then returned it back to her. The constable shook his head at the PSI and went back near the driver’s dead body. She replied, “No sir, its fine. My landlady is a doctor and I will get myself checked-up by her.” She pulled out a piece of paper, requested for a pen from the PSI and scribbled down her name, address & phone number, and handed it over to the PSI. They slowly walked over to the other side of the road and hailed another auto-rickshaw to take them home. The next day morning, Saakshi answered Maanvi’s cellphone. It was the PSI D. K. Gowda on the line,asking for Maanvi. Saakshi took the instrument to Maanvi who was lying down on the bed. Maanvi, “Yes, okay. I understand. Thank you.” She hung up the phone and saved the number on her phone. Welcome to THE SHOW OF THE 3rd MILLENIUM! We’ve had contestants from the 2nd MILLENIUM as well, right from the time the vehicle horn was invented. The show wasn’t as competitive, popular & successful then, as much as it is now! Great? So how do you participate? Damn simple! If you drive a vehicle in any part of the country, you already are a participant in the phenomenal success of the untold, unregulated & the free-for-all – “Honk India Honk” pure reality show. Honk to check if your vehicle’s battery is alive, even with the ignition off. Honk to call your family & friends (F&F) to get into/onto the vehicle. Honk to just call your F&F to their window/balconies to talk to them loudly from your vehicle. Honk to announce the arrival of your “cavalcade” to all the low-beings on and around the street. MOVE SOME DIRT! Honk to get the vehicles before you to get off the road and make way for the ROYAL YOURSELFNESS! Honk if you’re late for work; honk even if you’re on time. BIG DEAL! Honk angrily if the signal just turned RED. DRATS… *@$%#^! Honk in frustration if the signal doesn’t turn GREEN quickly. WHAT-A-PAIN! Honk impatiently if the vehicles in front of you don’t move quickly when the signal has turned GREEN. DAMN THESE DUMB SNAILS! Honk just to irritate the drivers ahead of you, especially if one of them has given you a dirty look for honking already. WTF! HOW DARE HE/SHE? Honk at the traffic ahead of you; honk at the traffic coming from the opposite direction. SECULAR HONKING! Honk at the cud-chewing cow sitting right in the middle of the road. How come she DOESN’T KNOW that you’re in a hurry? Honk at the guy who just cut your path from the left. WHAT AN A*SEH*LE! Honk at the guy whose path you just cut from the right. WHAT AN IDIOT! Who gave him the license to drive? Honk at the crowded procession ahead of you. BLOODY ANTS! Honk at the large vehicles, honk at the small vehicles. NO DISCRIMINATION! Honk especially where there’s a NO HONKING sign. You score more points for sheer guts! Honk even if the road is empty & there’s no one to honk at. WHERE’S EVERYONE? Honk for NO REASON AT ALL! What the heck!? It adds auditory colour to the intricate visual tapestry of day-to-day street existence. I bought it; I’m gonna use it. It is part of an essential bat-like sonar echolocation system. It stimulates milk production in the cows. It scares off potential attackers as I run the gauntlet. My horn switch has only one position. A hammer is to pound things with; a horn… duh! If none of the above appease you to participate vigourously – you can also “Honk if you’re lonely tonight“! And/Or just for fun? Interesting behaviourial explanation: Why we do what we do? Yeah, I’d been noticing it over the last few days that the count of comments for the posts was incorrect. And it was consistently missing out later posts. 😐 I was unsure if the ‘bug’ existed in WordPress or it was due to the theme that I use (if that mattered). I first thought, it probably didn’t count posts by the same person – or by the author… but that theory didn’t match for every post. Googl’ing for the problem resulted in top 2-3 results which were tangential to my issue. So avoided that. When was the last time you saw the Independence day flag hoisting or Republic day parade, live, or on TV? When was the last time you sung (or even hummed on) the national anthem? Though these were a couple of the “symptoms” we used to proudly show-off to demonstrate our “patriotic fever” towards our motherland, they seem to have faded away in our past – drowned in our current life-style. We used to love pinning/sticking the Indian Tricolour on our shirts, T-Shirts, bikes, cars, doors, etc. ; running & cycling around with the flag held high; and wishing everyone a “Happy Independence Day” or a “Happy Republic Day”. Nostalgic, aah! These “symptoms” used to get us a “high” and were on “display” only a couple of days before the 15th Aug and the 26th Jan — Hence, I’d coined it as “One Day, Maa Tere Hum“… (Read it like: Vande Mataram!). 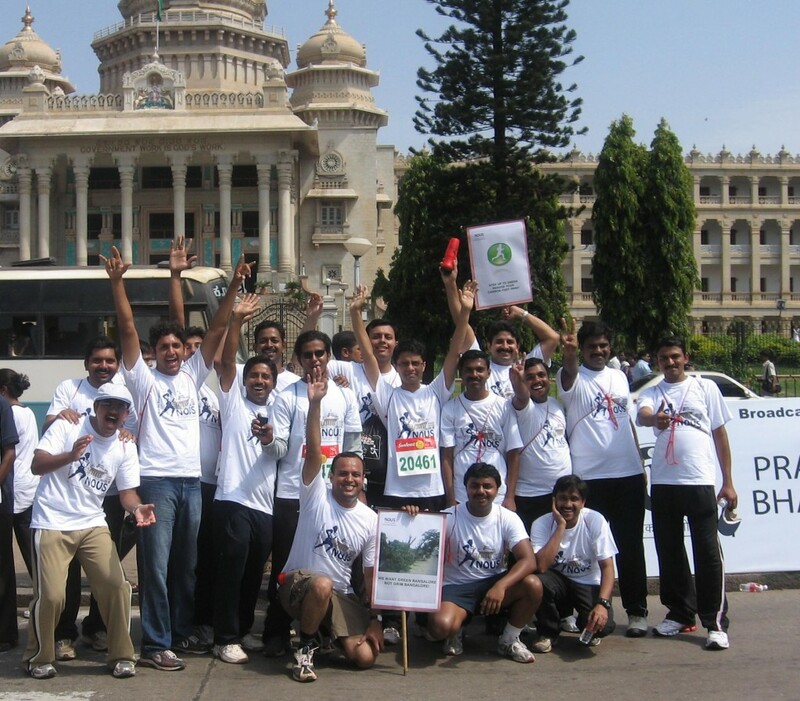 With the country completing 62 years of independence, what’s on your to-do list for this 15th Aug 2009? Chak De… Chak De… Chak De India! All offices have numerous controls & restrictions in place, to avoid/reduce the obvious misuse of the facilities offered for work. Access restrictions to hardware device(s) (like CD/DVD Drives, USB ports), restrictions accessing the internet, blocking/limiting uploads & downloads, to only allow restricted software to be installed, and likewise; are very common. Deploying & administering such controls & restrictions are also relative easy today, especially with the system administrator-friendly tools & utilities available today. The device blocking utilities hook-up themselves to the OS and intercept any calls to the devices they are programmed to block. They detect & allow valid calls to the devices, while blocking the unwanted ones. So – if a USB blocking utility intercepts a new USB device being connected; it checks if its an allowed device – like a USB mouse or a USB keyboard; or if its one of the devices to be restricted – like a USB Stick or an iPod or an external USB Hard Disk Drive (HDD) – and behaves accordingly. The utility passes the allowed device calls through to the OS’s handler, and discards the other calls – to achieve its purpose. These utilities are typically developed as a Windows service which run at the Windows startup. These services cannot be started or stopped by the user. To employ better security these utilities also have a seperate process or a thread or another service running/polling to monitor if the primary service is running. If it finds the service stopped – it restarts the service immediately. I’ll talk about the endpoint device blocking product, GFI EndPoint Security (to block iPods, USB Sticks & other such endpoint devices). You can review the $25 per computer product’s features here. All I needed was one free & powerful utility Process Explorer, from Windows Sysinternals (erstwhile SysInternals.com by Mark Russinovich & Bryce Cogswell). Next I launched the Windows Services Manager & changed the “Startup Type” to “Disabled”, for the GFI service. The service was left running, untouched. Alternatively, you can also use the AutoRuns utililty from Windows SysInternals again, to disable the service. Finally – just restarted the computer to start to a successfully disabled GFI’s monitoring service. I then renamed the folder name – to ensure it wouldn’t start again – *if* the office’s network policy re-enabled the service when it was redeployed afresh to my computer. Similarly (not the exact same method), I was also able to disable the McAfee Viruscan which used to hog my CPU (90-95%) & RAM (upwards of 180 MB) whenever I used Microsoft Outlook or opened/extracted any ZIP/RAR files. There probably is a leak in their real-time scanning module, in the version we have at the office, or the problem occurs only on Windows Vista (which I use); because the hogging is comparitively low on my colleagues’ Windows XP Pro computers. Nevertheless, instead of implementing such controls & restrictions, if the companies undertake imparting regular education to their employees on workplace ethics, I think it would go a long way. This is just like the traffic policemen standing *after* the traffic signal posts or in the *middle* of the one-ways, to catch the violaters & “extort” fine/bribes. Instead (& I always crib about this), why can’t the traffic policemen stand *at* the traffic signal and STOP the potential violaters from breaking the law in the first place? Similarly they should stop any drivers from entering into a one-way, in the first place. This topic is for another blog, however couldn’t avoid blurting it out. I noticed a red & white card lying next to my right shoe while waiting at the Madiwala checkpost traffic signal, on my way to the office. I bent over & picked it up. I wiped the wet dirt which had covered it. It was a card driving license (DL), and the name on the card read “Kavindra Rai”, above his father’s name and a very short one line address (the name of a road) in Darjeeling. I launched my web-browser, and popped the query to Google. Yeah – “Mullah ki daud masjid tak.” I thought Google knew everyone on this planet… however, I was wrong. Either Kavindra was not from earth, or I had exceptionally high expectations from Google (which obviously works only as per data available to it, so nevermind!). Searching on a few social networking sites, on LinkedIn & even Skype contacts did not result in anything – so, it seemed Kavindra was probably not very net-savvy. But then isn’t everyone in hi-tech Bangalore a net-surfing online animal? 😉 Naah, theory = FALSE! Misconception about Bangaloreans. I then ventured into the BSNL West Bengal website, navigated to Darjeeling & tried to search for a phone number registered to his dad, or to him. There were a few name matches, but no address matches. I did call up 2-3 people whose names matched, but they turned out to be “wrong numbers” (Yeah, they told me that, though I knew I had dialled the number correctly. :-)). Why is it never a “wrong caller” instead? Anyway, my numerous other tries with some combinations, resulted either in almost the same list of people, or else the nondescript, “No search results”. I called up a couple of local BSNL offices, and got the know that the nearest telegram office was at the Koramangala BDA Complex. I visited the telegram office there, collected the form, filled it up… gave a deep thought… and didn’t send it. Why didn’t I send it? : Well… telegrams are delivered by BSNL, the telephone guys. Would they really be able to find the person at the brief one-liner address in Darjeeling? The odds, I thought, were very low. I was thinking – with such a brief address, this task could only be assigned to The Indian Postman. He was my final option too! With the backing of my trust & logic, I expected the postman at Darjeeling would either already know the person addressed, or atleast put in some additional effort in tracing the person addressed. I went ahead and bought 2 postcards for Re.1 (yeah, no more the 15 paise we’ve known it to cost… its costlier now!) 😀 . I scribbled a short message about the DL I’d found, my contact numbers & just requested the recipient to call me. Quite a few pessimistic thoughts crossed my mind: what if Kavindra’s residence had changed and that was an old address? What if Kavindra had not informed his family about the lost DL and now could be rebuked because of my postcard? And even worse thoughts – What if Kavindra was into some illegal activities? What if he’d run away from home & was not in contact with his family? Setting these thoughts aside, I optimistically dropped the postcard in the mailbox & started my wait for that phone call from Kavindra Rai or his family. About 10 days after I’d mailed the postcard – I received a phone-call in the middle of a meeting. The caller identified himself as “Kavindra”. I immediately recognized him and exclaimed “Oh, Kavindra Rai! Is that you?” – He sure was the Kavindra Rai I’d been trying to reach for soo long. He said we could meet over the weekend and then he would collect the DL from me. I quickly agreed and hung-up, couldn’t keep the office meeting waiting for me for long. Kavindra & me met up on the next Sunday – and I gave him his DL. 🙂 It was also very kind of him to carry along a pack of Darjeeling Tea he got for me, as a token of his thanks. I asked him, how did he manage without the DL for about 3 weeks, to which he said he had a photocopy of the DL with him, so wasn’t so worried about it. Yeah, the RTO Officers @ Bangalore are very accomodating, eh?! We, the Indian salaried class, run the country with our Tax-Deducted-at-Source (TDS) + Surcharge + Cess, is well-known. Ofcourse, there are the Ambanis, Mallya, Birlas & even Shah Rukh Khan & Akshay Kumar, who’re some of the top tax payers of the country. But then its us who pay a relatively high tax as compared to the business class. During a discussion with my friend KV (K. Venkatesh – I’m sure most of you know him) on this subject last year, he’d pointed out that as compared to a relatively secure job & confirmed salary at the end of the month (yeah, the IT Dept. thinks so! ), the businessmen carry a relatively large business risk of the business not doing well and their investments going for a toss. However, I’d like to point out – though I would probably be the lowest earning member of the apartment complex I stay in here at Bangalore, I am probably the highest tax payer amongst them all, if you compare the incomes! Any purchase that the businessmen (no offence meant!) do like a property, a car, or a music system, or books, CD, DVDs, or even a computer at home – they claim it all as business expense & even register losses. They even make their wife & children as partners in their businesses and withdraw plump salaries on their behalf. While we, the salaried class, get *limited* rebates that too for home-loans & investments only. Nothing personal here, and I know they all work very hard too, like us. This is also true for small shop owners like roadside paan-wallas, electricians, etc. I’ve heard stories of paan-wallas who come to their shop in chauffeur driven Toyota Corollas & Honda Civics. These are also the people who don’t bother about paying a bribe to get their work done at government offices. They have (obviously untaxed!) black money, which they can splurge at the drop of a hat. So: what does an Indian income tax-payer get, as compared to an income tax-defaulter? NOTHING! The Indian tax payer doesn’t see any value in paying income tax. This has been pinching me and I’ve been carrying these few thoughts about how to get some special value-adds for the tax-payers, as detailed below. This thought may not be 100% in its own – with my relatively limited knowledge of “how things work” here – but I’d like to suggest this and I feel confident that this (or an appropriately modified form!) can help be a boost to the tax collections in the country. Tax payers in the country should be categorized based on the tax-slabs and/or the annual tax they pay. The National IDs which the government plans to issue to all the citizens can have this added “Tax-payer status”, and/or be differently colored for different categories. This can also (more appropriately) be done at the PAN card level, but with the logistics involved in getting all the currently issued PAN cards updated, it might be a grand exercise. So while the government is at it for the National IDs, why not add a PAN number & tax-payer status to it. Based on the tax slab and/or annual tax paid categorization there should be various priorities/reservations (or if you want to call them with the fashionable: Quota!) available to tax-payers for various things like a new phone connection, a new gas connection, bus/train/flight reservation, a new water connection, a new electric connection, a court case hearing (even special fast track courts), school & college admissions, and such. This may sound similar to an “economic condition” based quota system which was proposed by many as against the currently misused caste & religion based quota system. 1. The tax payers will see *value* in paying income tax, rather than defaulting on it. 2. More & more currently non-tax payers (or defaulters) will want to come into one of the tax-payer brackets. 3. More people will start declaring their correct income & start paying their income tax due, to climb up the tax-payer category. 1. Recognize the tax-payers and give them special treatment. Inside the Kanteerva Stadium, Bangalore. From the Gate 11, this was where we were waiting to enter into the ground/tracks. Inside the Kanteerva Stadium, Bangalore. A bunch of us Nouseans holding the placards high. This time on the road, out of the stadium. I’m there in the front with the gray track-pants. This time on the road, out of the stadium. 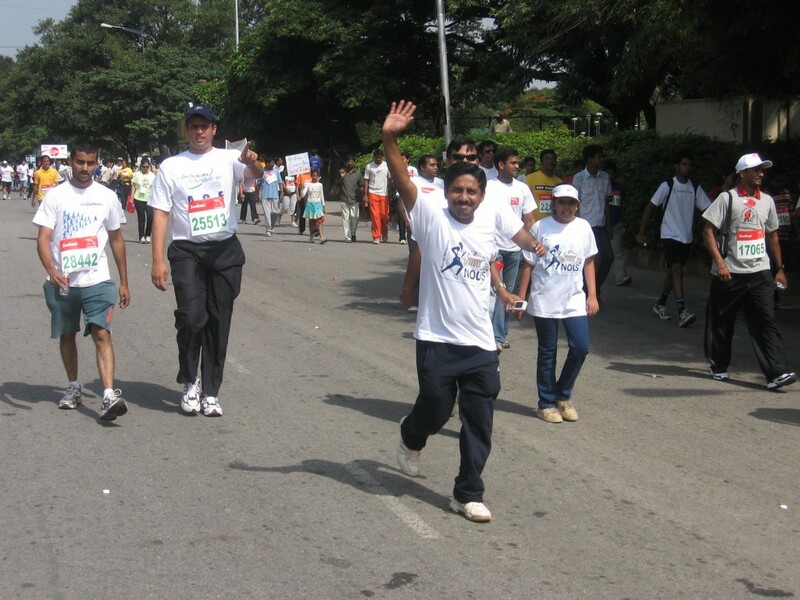 And here’re Aji waving out & a partly visible Sunil Shankar right behind Aji. The Famous Five – After completing the mission. Sunu, Abraham, Suresh, KB & me! Whew! The Famous Five - Mission accomplished, at last! 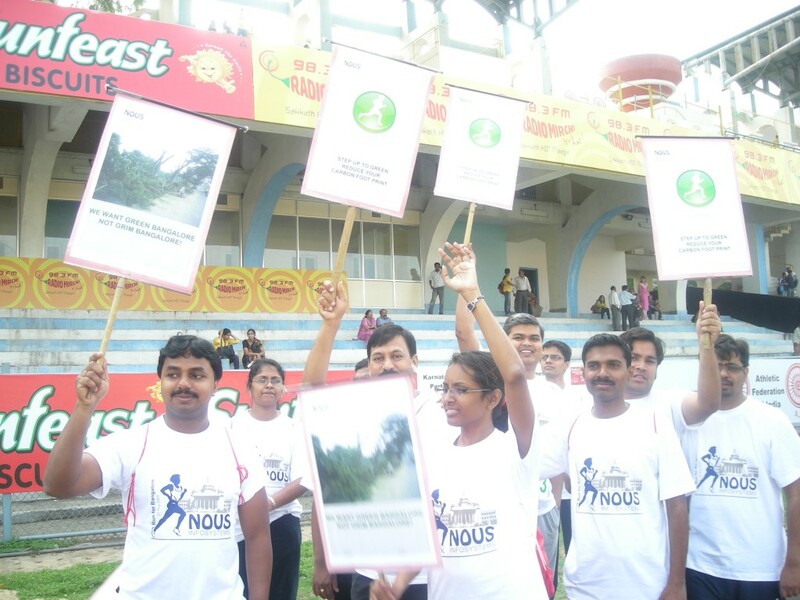 Thanks also to my employers Nous Infosystems & the HR team – who organised this event for all of us. The Sunday started off for me with a sleepless night, as I slept (& kept) wondering if I would wake up on-time… worrying if I wouldn’t be on time & miss the 08:30 missive by Maryann (our Sr. HR Manager) as the time to meet up opposite the UB City entrance on VM road. I woke up, well before the 3 alarms I’d set for myself & was ready to leave home by 08:00. Stretched myself a little, and left home after having a couple of glasses of water. I was supposed to meet my colleague KB at a parking place close to Kanteerva Stadium, from where we were to walk to UB City and meet up with the rest of the guys from my company, Nous Infosystems. 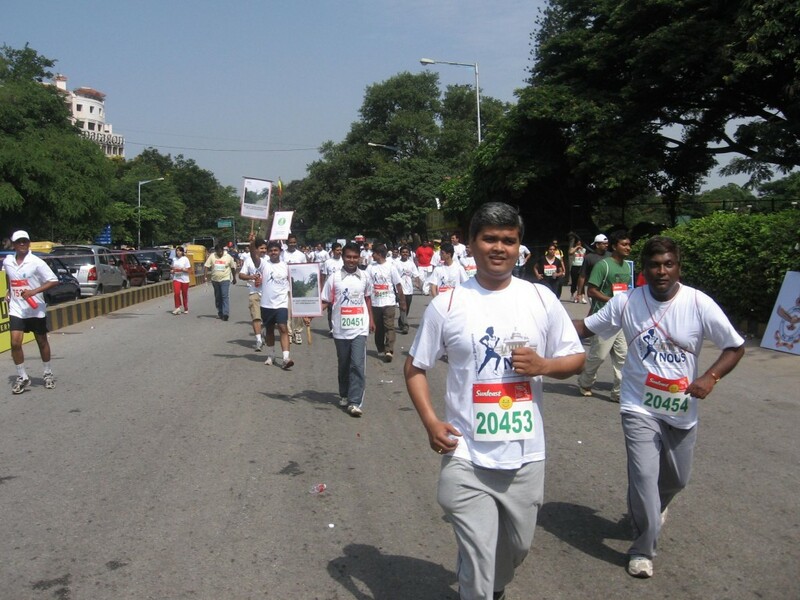 Coincidentally we met up right at the parking place and started our “marathon” walk towards UB City. 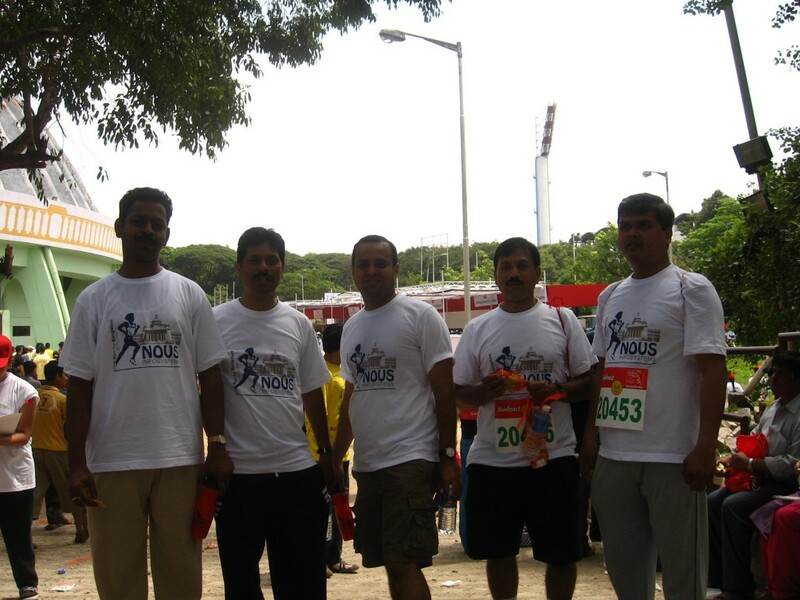 We walked a little more than half a km to reach UB City at 08:20 and waited for the rest of the guys from the office. 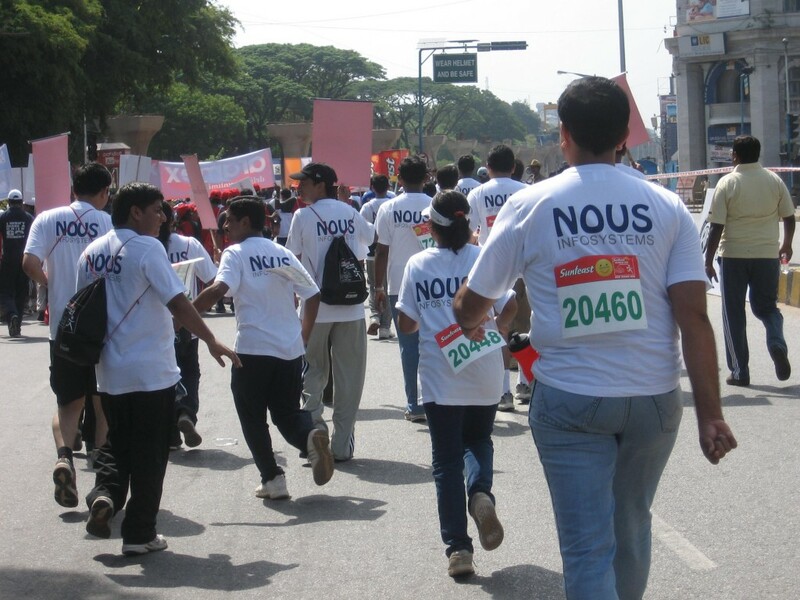 The Nous T-Shirts (official-wear) were good, though could’ve been better without the light gray colored text. The text wasn’t quite visible on a white T-Shirt, however I guess there were constraints that the designers couldn’t bypass. Nevertheless, they looked pretty good! We got into the Kanteerva Stadium from the designated gate and then went over to the Gate 11 from where the participants for the 5.7 km Majja (fun) run started their marathon! 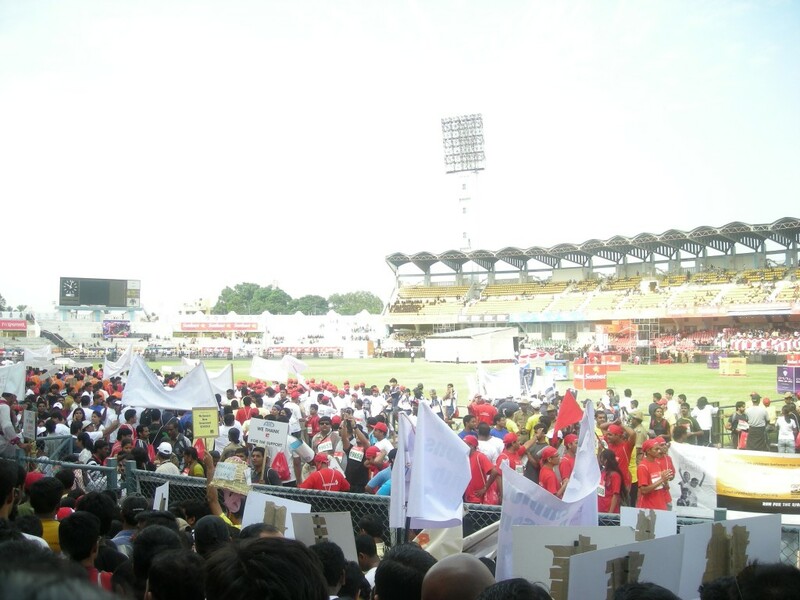 Gate 10 was overflowing with participants and the participants from the Gate 11 were also made to enter the ground from the same entrance as Gate 10. Nevertheless, we *finally* started our run at 09:30 hrs. IST and slowly worked our way out of the stadium. 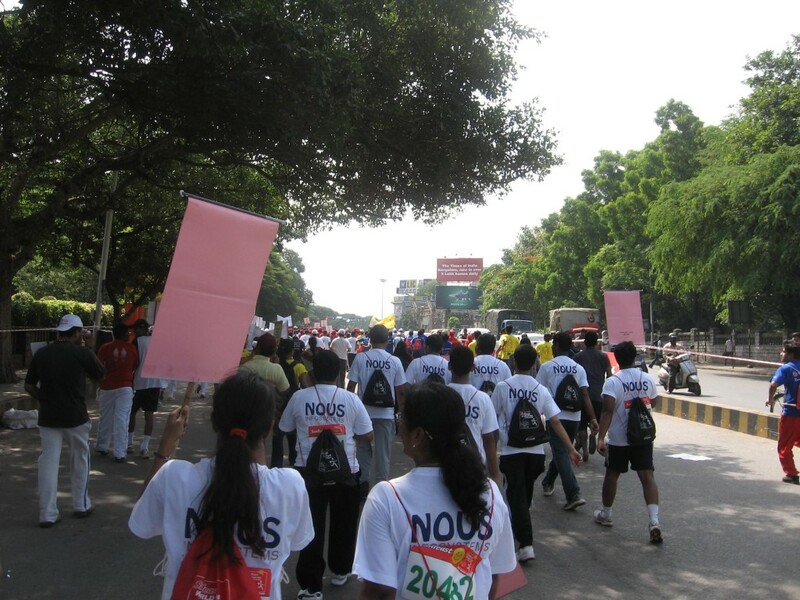 There was a huge crowd for the Majja run – official count ~13500~ – and most of them were corporate representatives in their “official-wear” with placards/banners in hand or wearing caps. 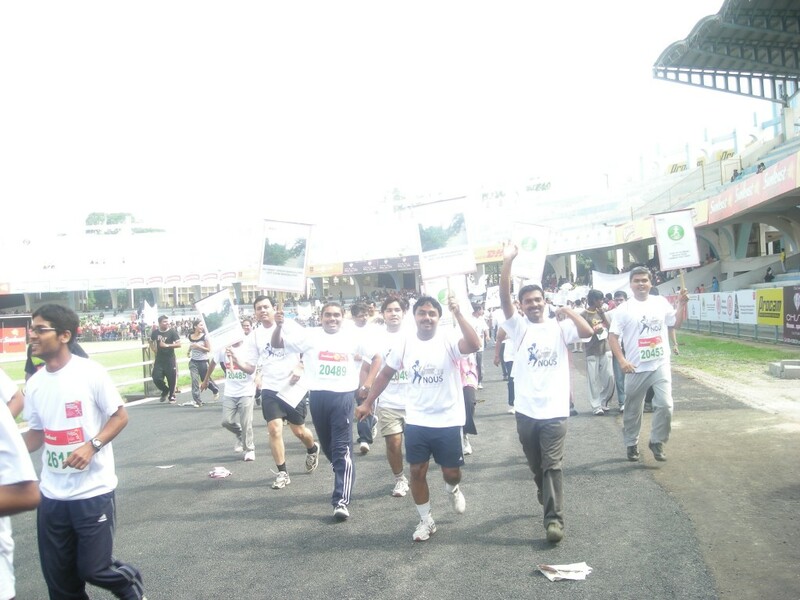 The event was high on spirit & enthusiasm as there was no competition, pure participation. The sad part about the run were the roads strewn with litter – especially the small KF water bottles, thrown on the road by the runners after emptying. Later, I passed a woman participant in Cubbon Park carrying a couple of large polythene bags filled with these strewn bottles – hats-off to her! Winding across the route, we – 4 of us from Nous, viz. 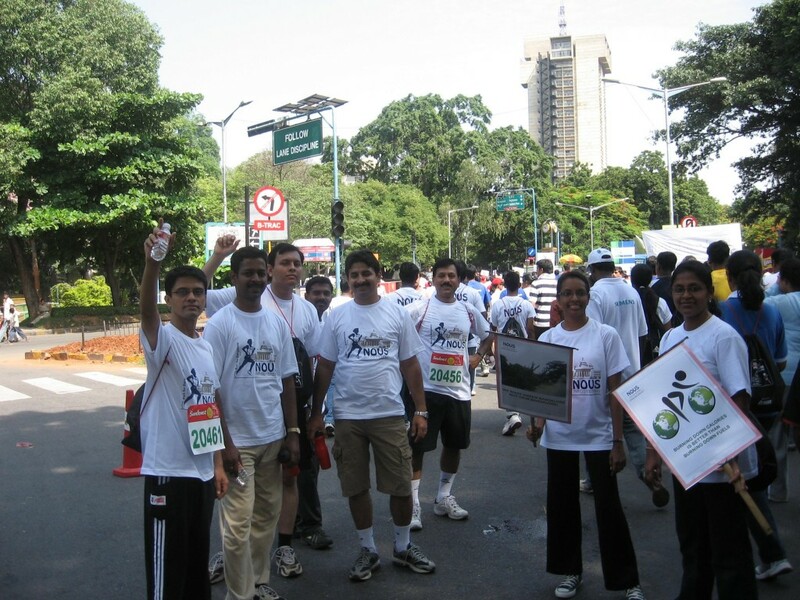 Abraham, Sreekumar, Santhosh & me – finally completed the 5.7 kms stretch in ~00:50:00! Back in Kanteerva’s enclosure at ~10:20 hrs. IST for the water (gasp! ), cheering crowds (whew!) & refreshments (wow!). 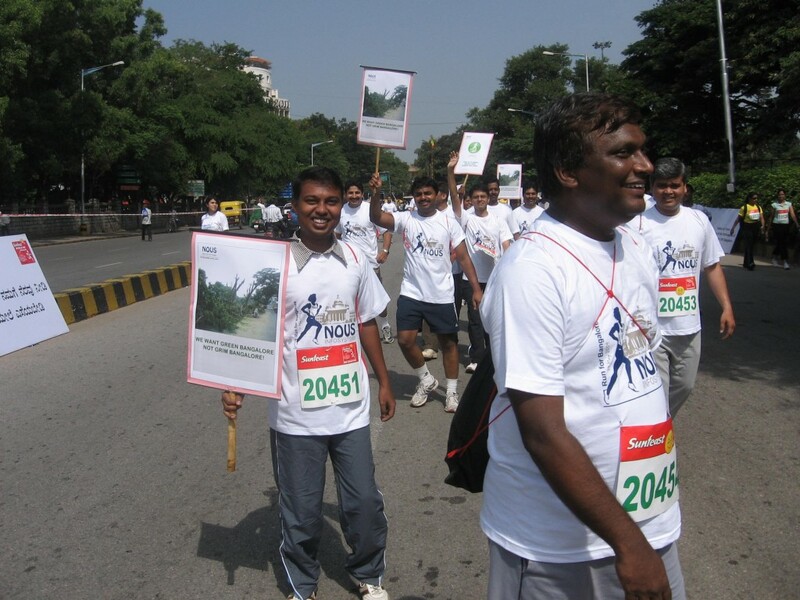 Though the event was to encourage a GREEN BANGALORE, a couple of things could’ve been organized better to really show the spirit. 1. They could’ve organised BMTC buses from all around Bangalore to pick-up and drop the participants. This would’ve saved a lot of fuel + reduced the parking hassles at the event. 2. Instead of supplying KF water bottles, the organizers should’ve encouraged the participants to fill up the water bottle, given in the kit, at the watering holes. The littered roads were cleaned within a short while after the event, which is good – but it could’ve been avoided altogether – as there *was* a better & greener alternative.